Destrehan’s Lady Wildcats trip to the sweet 16 Tournament turned out to be a great disappointment. The Lady Wildcats loss to the Southwood Cowboys 53-42 and pushed them out of the Sweet 16 State Tournament. With high hopes and a good attitude the Lady Wildcats stepped on to the court at the University Center at Southeastern ready to play and ready to win. However, it was quite evident that the adrenaline was pumping just as high on Southwood’s team. Coming into this game as defending class 5A state champions, Southwood would prove to have a feel for what was needed to control the game. Southwood Cowboys winning the tip off and making the first points of the game and managed to keep their composure throughout the game. This composure was kept through 5 ties in the game and 8 lead changes. Southwood became even more intensive and deliberate in their game. At the end of the first quarter, the score was tied 10-10. Nonetheless, Southwood’s strong defensive under the goal allowed them to create a gap in the score in the second quarter, closing out the half with a lead of 7 points. The Lady Wildcats picked up momentum in the third quarter with 4 of their six fast break points created by Shanna Richards and Twanna Lee. As well, Twanna Lee and twins Shanna and Shunna hit 3 pointers to open up the quarter. Destrehan’s defense was tight and intense and it did not prevent Southwood from scoring. Southwood, Porsha Black and Zevy Ivory, truncated any further activity underneath the goal. Their presence reduced the possibility of the Wildcats scoring or even rebounding. Even with 7 steals accumulated between Shunna and Shanna, they were unsuccessful in turning them into points for the team. It was a series of missed lay-ups back to back and missed free throws that would lead to the demise of the Lady Wildcats in the fourth period. Destrehan/s leading scorers were Lee with 15 points and Shunna with 18 points. Black and Ivory were the leading scorers for Southwood. Ivory collected 20 poins and Black with 10 points. Overall, Destrehan never really seem to get in sync with each other. Candice McGee who usually leads in rebounds had tremendous difficulty under the goal with only 4 rebounds. She wasn’t as aggressive under the goal as usual. However, Schamayne Moses stepped up to lead the team with 11 rebounds. 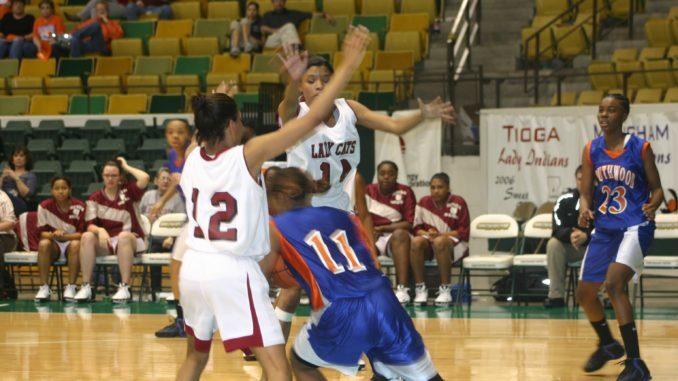 This was Destrehan’s third time participating in the Sweet 16 Tournament. They worked extremely hard and earned their right to be in the University Center on center court. However, the game goes to the team who sees and builds opportunities during the game, finds the opponent’s weakness and seizes the moment to score. The victory goes to Southwood who once again claim the title of District 54 State champs beating Airline in the finals 49-42.